A luxurious and secluded mountain retreat, Woodhaven is one of only 2 houses located on over 240 wooded acres. 2400 square foot custom built log home with high vaulted ceilings, handcrafted railings, wormy maple floors and wood-burning fireplace. Large back deck with plenty of space to hang out, 4 person hot tub with mountain views, large fire pit area for those beautiful mountain nights. The house is handicap friendly with entry ramp, wide doorways and grab bars in the downstairs bath. Location is 12 minutes from Chimney Rock & Lake Lure, 30 minutes from Asheville, & 25 minutes from Black Mountain and sits at an elevation of 2800 ft. The main floor has an open floor plan kitchen, living and dining room, floor to ceiling windows, master bedroom with King sized bed, TV & en suit with garden tub and steam shower. The second bedroom has Queen sized bed and another full bath. Upstairs in the loft is the TV with full sized futon and sofa. The third bedroom has a bunk bed with double on the bottom and twin up top. Woodhaven is dog friendly with a pet fee but sorry no cats. 1. WOODHAVEN REQUIRES A 3 NIGHT MIN. STAY. 2. Front wheel or 4WD recommended. Best to arrive during daylight hours. 3. the satellite wifi is NOT unlimited. It is available for checking emails, Facebook, and surfing the web. We're sorry but you are NOT able to stream movies, music, or play games through the internet or the service will be shut off. We know Asheville and want to make it easy for our guests to enjoy all that this wonderful area has to offer. Our 170+ luxury cabin and vacation rental options will provide you with a gateway to a great vacation in the mountains of western North Carolina. Choosing Greybeard Rentals means that you have access to some great vacation rental options as well our friendly, qualified staff that is dedicated to your satisfaction. We can't wait to welcome you. Woodhaven is a luxurious mountain retreat with plenty of privacy. 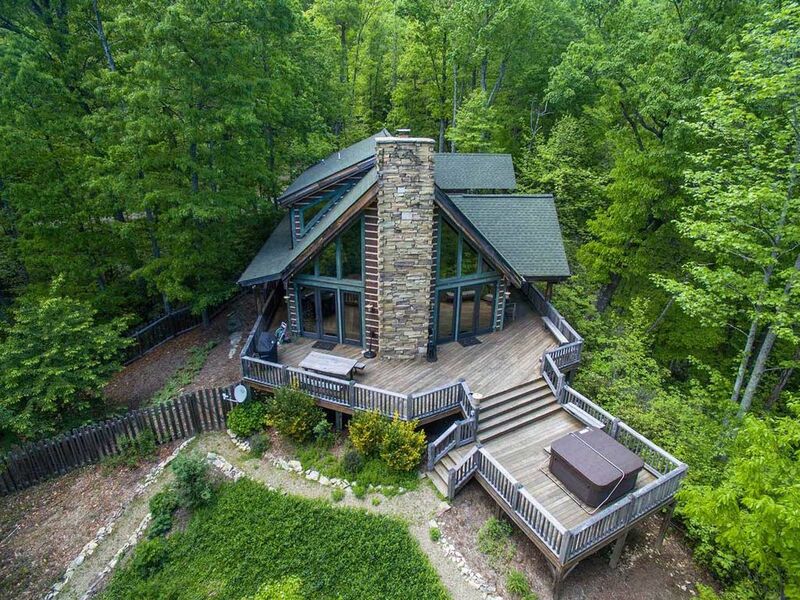 This 2400 square foot custom built log home will provide you with the perfect mountain getaway. We loved Woodhaven. Esp. all the amenities, which most dream about having in their own homes. Once up the long road (and yes, you do need all wheel or 4 wheel drive!) you feel like you are a million miles away and all your cares subside. The views from the house, deck and hot tub are to die for. An added bonus was when we turned on the stereo to find piped in music in all rooms, even the deck. Lucy, our golden, had her own little area totally fenced in and also gates. She loved breathing the mountain air and all the hikes available at our doorstep. Just a couple of things - the bed in the master has a topper on it which is very very soft and squishy which was difficult for us since we have a firmer mattress and not so great backs. Also the bottom bunk bed upstairs had a place in the middle that "popped out", possibly a spring. The TV and dvd player are upstairs in the loft, not in the great room. It's very cozy up there. We LOVED the town of Black Mountain, Chimney Rock, Hickory Nut Falls, Esmeralda Inn and Hendersonville. It was a long journey, all the way from Littleton, MA - 45 minutes west of Boston. And was worth every minute of the ride. ENJOY, YA'LL! Thank you for the notes and feedback! We appreciate you letting us know what could be improved. I'll relay to our team. I'm glad you had a great stay! Fabulous cabin, outfitted with everything imaginable. Beautiful setting with plenty of activities nearby. Perfect destination for visitors of all ages. Sounds perfect! I'm glad you had a nice time on your vacation at Woodhaven. You feel like you've stepped away from all your worries and the world, it is isolated and peaceful. Great house! Very clean! I loved the porches on the House, and the fenced yard was great for the dogs. The kitchen was so well stocked!! Beds are comfortable and the master shower is amazing. We used the path to hike down to the babbling brook everyday to collect icicles. The distances to neighboring towns was longer than described. That's great! I'm glad you were pleased with your stay at Woodhaven! Love how this cabin is so isolated and quiet. Was a bit disappointed to see a house built not too far away. Hope that the mountain doesn't get built up! Thank you for the feedback on your stay at Woodhaven! Glad you enjoyed your time with us at Greybeard. Overall, this was an amazing experience. The house was extremely well kept, which included folded linens, clean floors, and even a "day of" cleaning sticker on the hot tub cover, showing when it was last cleaned. There was plenty of space for our family and we truly enjoyed being able to escape into the mountains. The mobile app for Greybeard also proved to be extremely useful and really showed the professionalism of this rental company. For the interest of future residents, there are a couple of things to take note of. First, the location is VERY off the beaten path. While quoted at being 30 minutes from Ashville, that is only to the base of the driveway. Plan on 15 minutes to get from the house to the main road due to very steep terrains and gravel roads. Other than this minor difference in the posting, everything is as great as it seems! For the benefit of the rental company, I also have a few more suggestions. As difficult as it would be to maintain tree growth, I would suggest a few select tree removals in order to get that spectacular, unobstructed view that the open drone photos seem to indicate. While it is still evident and the view from the top of the mountain is great, I think it can be improved upon! Other than this, I wouldn't change anything! Please note that the cleaning fee is already included in this advertised rate.